Hi everyone! It’s that time of year… Happy Halloween! We are launching a facebook only mini Halloween Necklace Giveaway! Also – check out the 31% store-wide sale to celebrate! Read more on this week’s discounts! 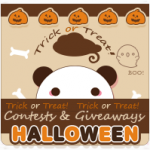 October 18th, 2014 in Announcements, Contests & Giveaways, Featured : Comments Off on Mini Halloween Necklace Giveaway!